From top: 1-2. The installation in the PCC community center. 3. View from the mourning wall side, large posters of endangered species hang from the clock sign. 4. Early start on the nature mandala. 5. Altar to the direction of the East, honoring air and winged creatures. 6. Final mandala before dismantling and offering it to the earth in gratitude for the gifts we receive from her. You can see more photos at Sacred Art Studio Facebook page. 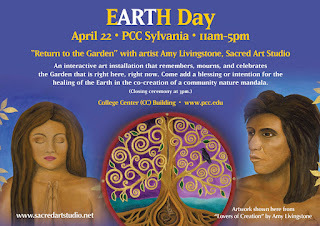 I was the featured artist on Earth Day at Portland Community College (PCC), Sylvania Campus in SW Portland. A beautiful day to celebrate Earth Day. Below is the brief introduction to my talk. My vision is to bring this installation to communities around the PNW and beyond. 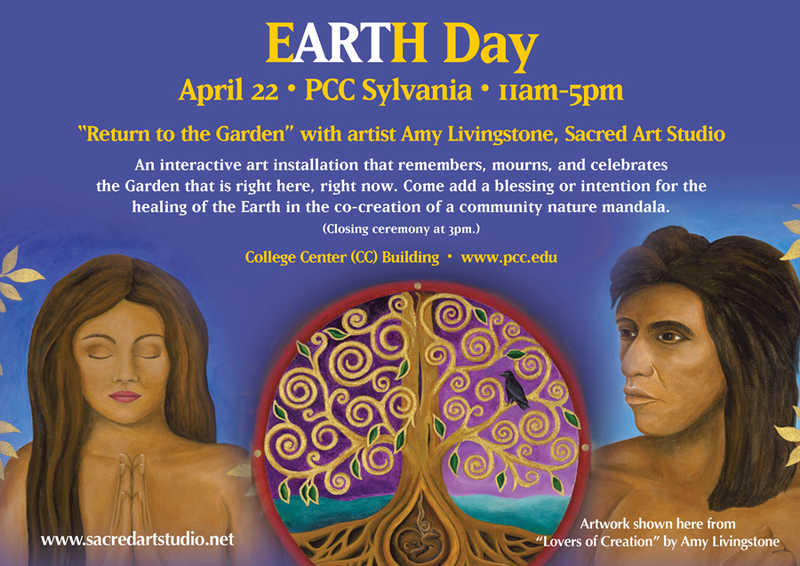 If you or someone you know might be interested in hosting me and this interactive installation “Return to the Garden,” please contact me via my website www.sacredartstudio.net. I can also offer an accompanying workshop which you can also read more about at my site.